Insect pests in the vegetable garden can decrease yields, affect the taste of vegetables and make produce unattractive. Over the years, a variety of pesticides were developed with differing degrees of toxicity to humans. In recent years, however, effective pesticides are available that are safer to use and are considered suitable for the vegetable garden. 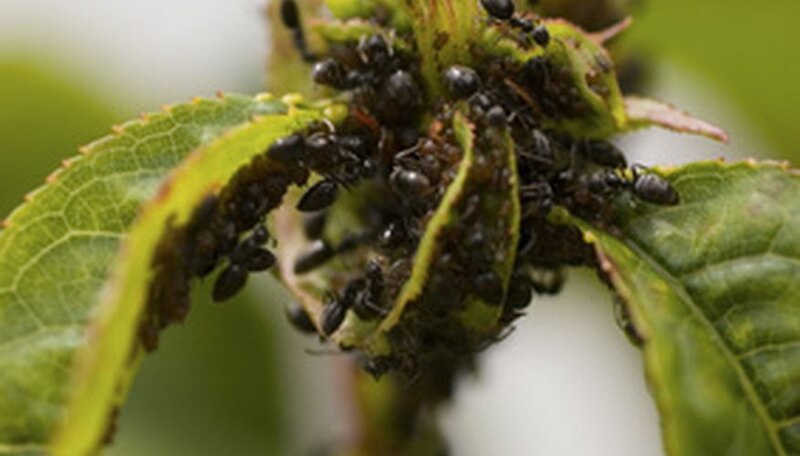 Neem oil works by suffocating insects and is a good choice for control of slow-moving, soft-bodied insects such as mealy bugs or aphids. It is also used for powdery mildew control. Neem oil comes from the seed of the neem tree, which is native to South America. It is can repel some bugs for up to one week in the garden but is best used as a spot treatment for insects because of its suffocating properties. Bt is a naturally occurring bacteria that is found in soil all over the world. Once it is concentrated and sprayed on plants, it kill worms, caterpillars and other leaf-chewing insects within moments after it is ingested. Certain strains of Bt, or Bacillus thuringiensis, have been developed to kill the Colorado potato beetle and mosquito larva. It has an active life in the garden of about one week after application. Spinosad is a concentration of bacteria naturally found in soil that kills insects after it is ingested. It is considered safe for use on vegetable gardens and can stay effective on plants for up to 30 days. However, it is toxic to bees and wasps before it dries. It is effective on all leaf-chewing insects, especially worms, some beetles and caterpillars. Pyrethrum is derived from the crushed flowers of the pyrethrum daisy. It is usually a powder and paralyzes or kills all insects it contacts if the formulation is strong enough. Although pyrethrum is an organic product, not all formulations are considered organic because they may be mixed with other items that are not organic. It degrades within a few hours when exposed to sunlight, so it is best to apply pyrethrum in the evening after the bees have stopped working, as it is poisonous to bees. Rotenone is derived from the roots of several different South American plants. It is used to kill or stun any insect it contacts. It is not considered an organic solution to pest control because it is often mixed with nonorganic material, but it is a safer alternative than chemical pesticides. Rotenone has a short lifespan in the soil—only three days—and active life of only a few hours when exposed to sunlight, so it is considered safe for the environment. However, rotenone is extremely toxic to fish so should be applied away from ponds and waterways.